Solar Cycle bottom ahead of sked? eHam > eHam Forums > DXing > Solar Cycle bottom ahead of sked? Solar activity cycle falls to the bottom 1.5 years earlier than expected. RE: Solar Cycle bottom ahead of sked? The first sunspot of Cycle 25 was seen over a year ago in December 2016, so perhaps Cycle 24 is hitting bottom early. Let's hope Cycle 25 rises fast and reaches a peak much higher than the present cycle. So Cycle 24 is bottoming out early and may indicate that cycle 25 will rise fast and reach a much higher peak than before. I like it, I'm going with this theory ! One thing is for certain: there is no stopping the solar cycle; the Early Solar Minimum is already here. 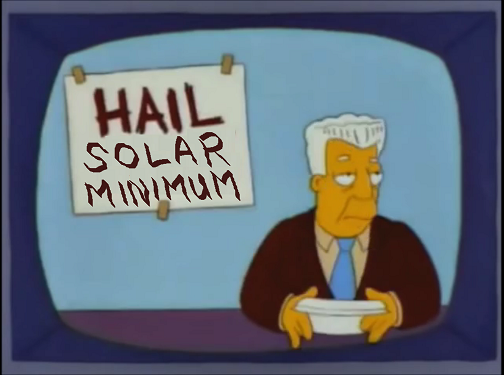 And I for one welcome our new Early Solar Minimum overlords. I’d like to remind them that as a trusted low-band personality, I can be helpful in rounding up others to toil in their swamps laying out beverages and 8-circles. I read all the links, and links referred to in the stories. I read ideas about cosmic forces going through the stars. It seems we humans know little about forecasting cycle 25. Since being a shortwave radio user since 1963 or so. My uncle was a ham since the 50's. Cycle 24 was the weakest in my life. I hope for better out of cycle 25, but not expecting it. However it develops. I will just have to deal with it. Conditions were SUPERB in ARRL 160M in December 2017 and on first night of CQ 160 CW this past weekend. I don't believe our best scientists know when the current cycle will bottom out, when the next one will begin, and what the numbers will be once Cycle 25 is underway. Those who predict the weather on earth have more data to work with than those who predict solar weather, and those guys are not always correct. They do a great job, but predicting the weather is not an exact science, and predicting a sunspot cycle yet to come involves too much guess work. Solar scientists can make an educated guess based on current data, history, or whatever, but we won't know until we are there. This was Dr Hathaway's model for Cycle 24 which was made in 2007. We now know that didn't happen. Cycle 24 was late getting started, and it's ending later than first predicted. And we really could have used those numbers. Once Cycle 24 was underway, he acknowledged his 1st model was incorrect and made a new model that was more realistic to the actual cycle. As I recall, Dr Hathaway predicted Cycle 23 fairly well. I have the greatest respect and admiration for all solar scientists, but they are not always correct. As for the current situation, we can enjoy some good 80 & 160 meter openings. My best years for 160M were during the time Cycle 23 was bottoming out. And those were also my best years for 6M. Not for F layer propagation, but had some good Es and TEP openings.